Our dedicated SketchUp gura Marc Leydecker decided, besides the many X-Plane jobs he’s doing, to paint two paintings for a X-Plane 11 stock aircraft/helicopter. 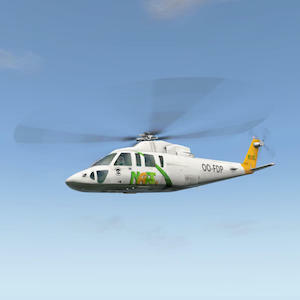 Marc has chosen this time for the default Sikorsky helicopter in Freddy De Pies (NAPS) favourite NAPS painting. And we’re at X-Plained are more then pleased to offer you this exclusive X-Plane 11 painting to registered users. And perhaps there’s more to come. Even we not always know when Marc had made something new besides his great and highly detailed airports. Anyway, enjoy this NAPS Sikorsky livery. Feel free to comment and/or offer Marc the necessary compliments. Want to see some exclusive screenshots before you download? Then you must check this additional screenshots link.